In the understated elegance of Thornton's Restaurant, Dublin , haute cuisine devotees and companions of gourmet food & fine dining, while sipping Bollinger Champagne awaited breathlessly the announcement of The World's 50 Best Restaurant,Sponsored by San Pellegrino and Acqua Panna. This prestigious awards ceremony is one of the most important events in the gastronomic calender globally and has helped to propel former winners such as El Bulli, the Fat Duck and Noma to Worldwide Superstardom. Suspense was building and tension was high to find out if the Roca brothers of El Cellar de Can Roca, would take back home the title for the second conservative year but alas it was not meant to be. The Winner of S.Pellegrino World's Best Restaurant 2014 was Noma, Copenhagen. Denmark. Followed by last year's number one, El Cellar de Can Roca, Girona. Spain. In third place, Osteria Francescana, Modena, Italy. Fourth place, Eleven Madison Park, New York, USA. 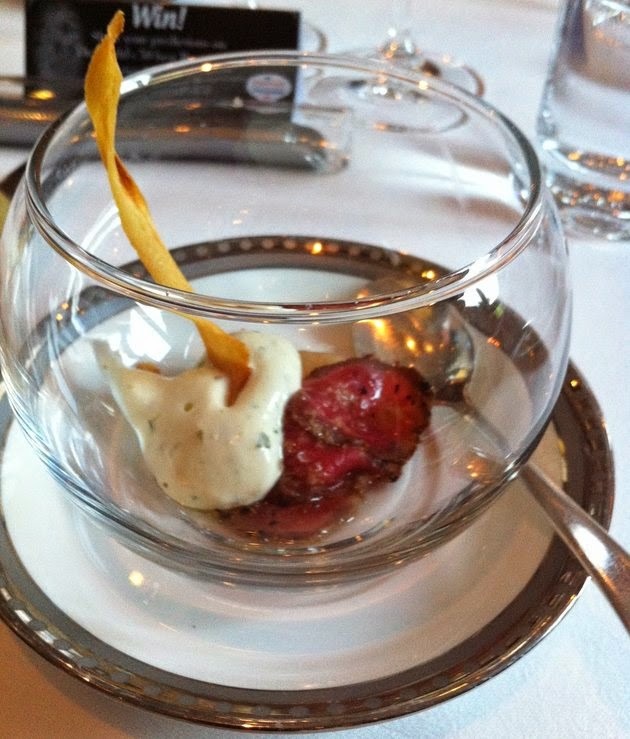 Fifth place, Dinner by Heston Blumenthal, London, United Kingdom. Sixth place, Mugaritz , San Sebastian, Spain. Seventh place, D.O.M, Sao Paulo, Brazil. Eighth place, Arzak, San Sebastian, Spain. Ninth place, Alinea, Chicago, USA. Tenth place, The Ledbury, London, United Kingdom. Most surprising though,was the absence of any French Restaurant in the top 10. However, not being in the least bias, Our own Michelin * Chef Kevin Thornton should have been there too. 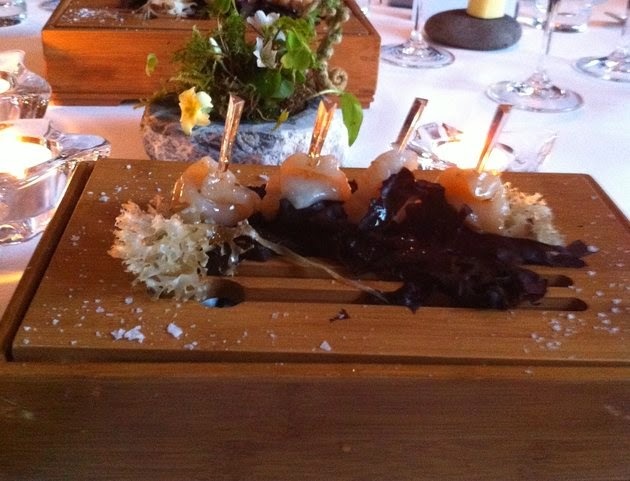 We were treated to a sumptuous tasting menu, prepared by the Master Chef , Mr Thornton himself and his award wining team. Here are a few of the dishes we had , all copiously washed down by a selection of fine wines from Katnook Estate and of course buckets of Acqua Panna &S.Pellegrino. We started our meal with an appetiser of Carpaccio of Thornton's Beef with fermented Turnip, Sheep's Cheese yoghurt & Parsnip tuile. A light and creamy sheep's yoghurt & fermented turnip mousse complimented these thin slices of beef to perfection, Wonderfully well thought out and even better to taste. Followed by a starter, which was served two ways, first being a Sashimi of Saltee Island Scallop & sea vegetables. Wafer thin slivers of Scallops were elegantly presented with a garnish of sea vegetables. They were so fresh and silky, they seemed quite literally and in the approved manner to melt in the mouth. Coupled with Grilled Bere Island King Scallop, Cauliflower Purée and painted plate. The grilled scallops didn't disappoint either. Perfectly cooked, they were moist and like butter on the tongue, they melted into a mouthful of pure delight along with a garnish of blk & red caviar, gold leaf and cauliflower tuile. 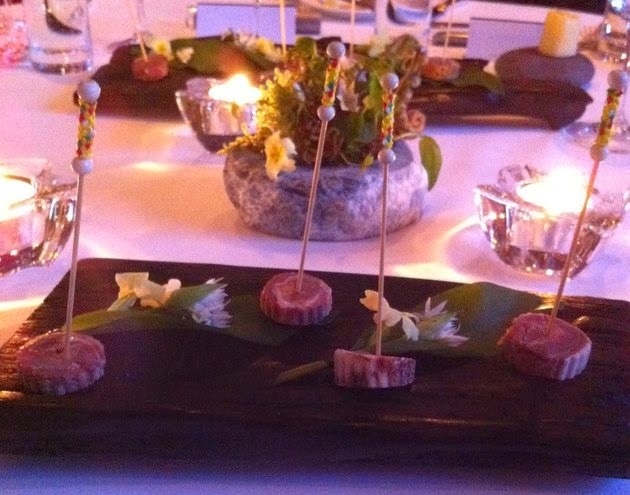 Our main was also a duo, first on, was Seared Rump medallion of Commeragh Mountain Lamb & Wild woodland garlic flowers. along with a trio of Commeragh Mountain Lamb fillet, shoulder and liver, Broad Beans, Carrot purée, Wood sorrel and wild garlic pommes mousseline. 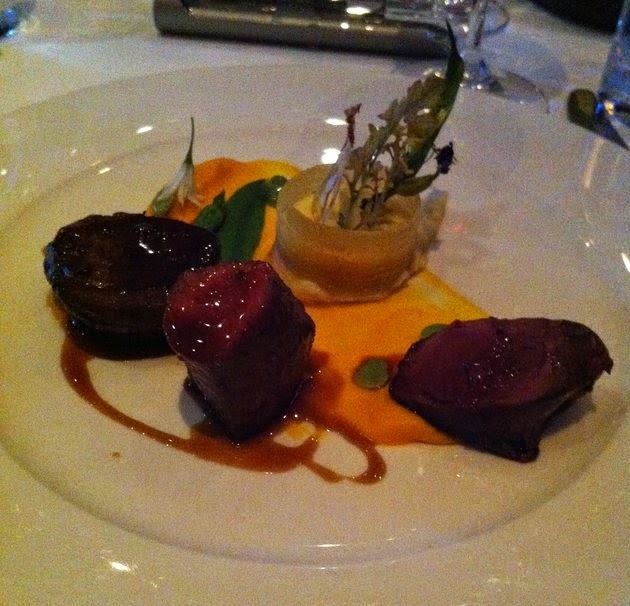 Smooth golden carrot purée, silky fragrant pommes mousseline, seriously succulent lamb were full of flavour. A very tasty and amazing dish, worth every last forkful. 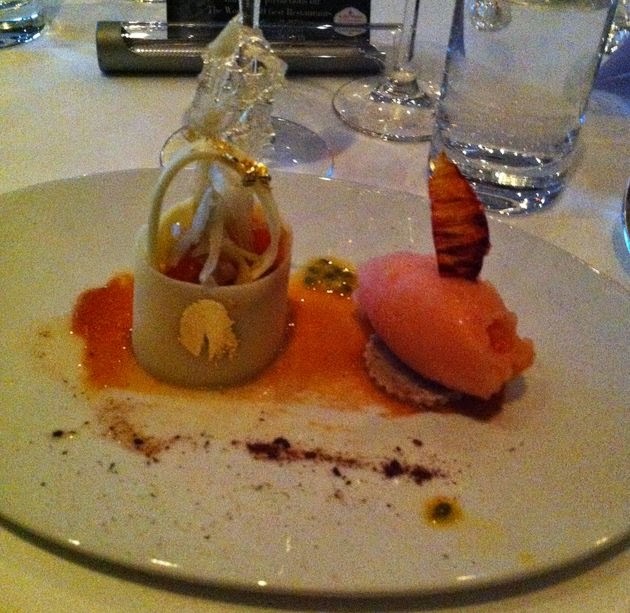 We concluded our meal with a Passion fruit and Blood orange wrapped in White Chocolate, Blood orange sorbet and Confit of fennel. 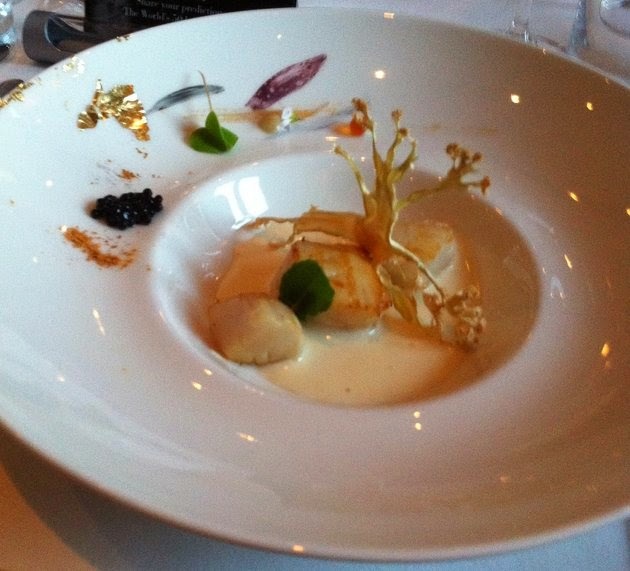 A delight to look at, it was a magnificent creation and an amalgam of textures with perfectly paired flavours. In all, this was an exquisite meal from start to finish,elegantly presented with inspiring flavours and faultless execution. So if you don't get to Noma, don't dispair ! Thornton's is on your doorstep on St Stephen's Green in Dublin. Thanks for post. Its great information for Best Restaurants.